There is a RADIUS bug in code below this release that can cause a system reboot when RADIUS authentication is denied for the client. 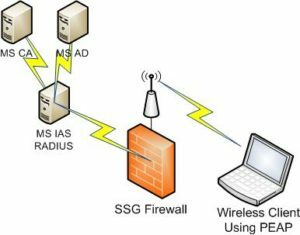 Create a RADIUS authentication wireless segment on a ScreenOS firewall. This uses the Microsoft IAS server component that is free with Windows server 2003. The configuration does require a active directory domain and a Microsoft certificate authority. All components are included with the Server 2003 OS and can be installed on a single server. These three roles can all exist on the same server without any issues in a small network or they can be existing and distributed on other servers in an existing setup. The configuration of this infrastructure is outlined in this technet article. After this is configured the wireless client software on the affected computers will also need to be configured. And the certificates needed for the authentication methods chosen will need to be distributed to the clients. The document also above outlined the group policy options for these setting changes and certificate distribution. When you connect to the SSID for the wireless segment the protocol needs to be changed to Protected EAP in the properties of the wireless interface. The Juniper ScreenOS wireless enabled firewall will be configured to communicate with this Microsoft RADIUS infrastructure to authenticate clients. There are two basic steps to the process. For this example the SSID is MyWireless on the wireless0 interface using “radserver” as the authentication server. When connecting there are sessions and statistics on the firewall and logs generated on the Microsoft IAS server. In the IAS mmc the logging area shows the location of the log file. There will be log entries for all connection attempts whether rejected or accepted. Sessions shows actively connected devices while the statistics show the counts since the last reset.